Advanced technology is screaming onto the construction jobsite today. Everything from remote driverless dump trucks to self driving concrete trucks, smart phones, iPads, laser scanners, thermal imaging cameras, RFIDS and geospatial devices are all being adopted by contractors on the jobsite. Some companies are investing in the new technologies and others are waiting. They will soon be screaming if they don’t pay close attention to the rapid development of augmented reality and its impact on all parts of our industry. Personal protection too, is about to get a makeover for the first time in decades. There are a number of companies testing ways to utilize the new technologies of augmented and virtual realities that work with articles of personal protection, specifically the ubiquitous hard hat and safety goggles. NASA, gamers and even surgeons are using new augmented technologies to improve safety, accuracy and productivity. New products are being brought to market that will improve productivity and enable “normal folks” to visualize 3d space much like in the movies. And it is not science fiction. One company is working to get the new technologies more evenly distributed in the construction industry and that company is Daqri. No, it is not an alcoholic drink, but using some of their newest helmets and safety goggles might make you think that you have been drinking. That is until you get used to the totally new world you enter when you put on one of their products. Their product lines include helmets and AR glasses and software that expands the data world to safety helmets and safety goggles. 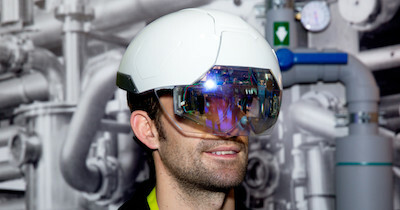 For the construction industry, the use of the augmented reality with the Daqri Smart Glasses or Smart Helmet opens up a new way for the craft workforce to experience the world they work in and allows them to be safer and more productive by “seeing” the information they need projected in front of them while they walk or work a site. I have asked my “tech” friends about the products and they tell me that currently there are three things that stand in the way of wide spread usage of the Daqri products on the construction worksite. First, OSHA has not approved them for the worksite. Second, the helmet is “neat” but it is heavier than the hard hat that they are used to. Third, the price is not yet in the affordable range for most construction companies to buy them in bulk. There is a fourth reason that I might also mention. The demand for Daqri Smart Glasses is so strong that you will have to until June of 2017 for them to ship. The potential market around these new technologies and the start up companies who are responsible for building and distributing them is evident in a recent Bloomberg interview between Brian Mullins, the President of Daqri and Josh Elman, Partner with high tech venture capital firm Greylock on Bloomberg News. Look for other companies to make a push to bring augmented reality into the construction jobsite over the next few years. Their introduction will make the jobsite safer, more innovative and make the workforce more productive. Other companies like Rhumbix, the construction data company, are closely watching the Augmented Reality development because it will work closely with their on-site data software.